Our regular column covering the deaths of significant - but lesser reported - people of the past month. 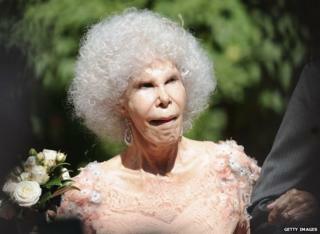 The Duchess of Alba was probably the most eccentric figure in modern European aristocracy. She held more than 50 titles, including being a duchess seven times over, and it was claimed she could travel the length of Spain and always be on her own property. A noted beauty in her youth, her private life in turn fascinated and shocked Spanish society. On the death of her first husband, she married an unfrocked priest and, when he died, she set up with a civil servant, 24 years her junior. In later life it was widely suggested she had gone under the plastic surgeon's knife. But she denied ever having any treatment. Among the privileges that went with her rank were not having to kneel before the Pope, and the right to ride a horse into the cathedral in Seville. A former member of the glam-rock outfit, Wizzard, the sound of Mike Burney's saxophone has become a ubiquitous part of the ever-lengthening pre-Christmas build up. I Wish It Could Be Christmas Every Day has been part of the festive season since it was released in 1973. A jazz man at heart, he originally played on Billy Fury's backing band before being recruited by Roy Wood, who formed Wizzard after quitting The Electric Light Orchestra. The cost of running the band meant no-one made much money and Burney carved out a career as a noted session musician working with a range of artists including Petula Clark, Chaka Khan and Cliff Richard. He also played for nearly a decade as a member of the Syd Lawrence Orchestra, a regular feature on many television shows. Paul Vaughan's urbane voice was a familiar feature on BBC radio and television. A former PR man for the British Medical Association he began contributing regular science features for the BBC's Today programme in the 1960s. In 1970 he auditioned to become the voice for the BBC's Horizon programme, on which he featured for the next 20 years. Just three years later he was invited to present Radio 4's arts programme, Kaleidoscope. He remained there for 25 years before an incoming controller ditched it in favour of Front Row, much to the annoyance of his loyal listeners. He was the author of a 1969 book on birth control, written for the Family Planning Association which, for the time, carried some daringly explicit illustrations. His voice was much in demand for commercials, the most famous of which was for a mobile phone company in which he spoke the phrase, "the future's bright, the future's Orange". Maggie Boyle's upbringing in London's Irish community gave her an abiding love of the folk music of her ancestors. Her parents both performed in local folk clubs and the young Maggie was singing by the time she was nine. Her prowess earned her the attention of Comhaltas Ceoltoiri Eireann, the body that promotes Irish music, but her opportunities in London were few and she became a civil servant. Her marriage to the singer Steve Tilson gave her fresh impetus to perform and she was asked to sing and play the flute in a folk ballet production by the Rambert Dance Company. Later she was recruited to sing the theme song for the film, Patriot Games, which necessitated her phoning her grandmother for a crash course in the Irish language. She released a number of solo albums and performed with acts such as The Chieftains and Bert Jansch who once described the "spellbinding, intoxicating quality" of her voice. Trevor Pharo's love of the Big Top was engendered when Billy Smart's circus visited his home town of Croydon in 1972. The teenager helped out by putting up posters and learned about clowning from Smart's publicity manager. Along with running his own printing business, he developed his skills and began performing at children's parties as Bingo the Clown. In 1985 he organised the first ever international clown convention in Bognor Regis. Hundreds of clowns from across the world descended on the usually staid Sussex resort and even policeman were seen on the street wearing red noses. He became a well-known fund raiser for various charities, often arranging for terminally ill children to fly to Florida for dream holidays. In 2009 he ran two adults-only circus nights in aid of a local care home for sufferers of Aids/HIV, which featured a host of performers including the Brighton & Hove Gay Men's Chorus. Actor Richard Pasco's finest hour came in 1972 when, in a production of Richard II, he and Ian Richardson alternately played the roles of the king and Bolingbroke. Critics were entranced by the contrast between Pasco's subdued interpretation of the monarch, against the more camp version offered by Richardson. It was a triumph for a man who was recognised as one of the great classical actors of his generation. He'd already made an indelible mark on the stage, including a couple of seasons at The Old Vic and a critically acclaimed portrayal of Jimmy Porter in Look Back in Anger. His 1966 performance as Hamlet impressed John Gielgud so much he gave him a part in one of his productions. Among his film roles was that of Queen Victoria's doctor in Mrs Brown, and he was a regular in many TV series including Inspector Morse, Kavanagh QC and Hetty Wainthropp Investigates.